A teenager was chased through a park in south-east London and killed when he was stabbed with a knife which pierced his heart, the Old Bailey has heard. Nicholas Pearton, 16, was caught up in a fight between members of two gangs in Home Park, Sydenham, last May, prosecution QC Edward Brown said. He collapsed in a nearby fast-food restaurant, where his parents saw him "lying dead or dying", he added. Six boys aged 14 to 17 deny murder. They cannot be named for legal reasons. Before Nicholas was murdered, the Shanks and Guns gang had clashed with rival group Black Mafia, Mr Brown said. 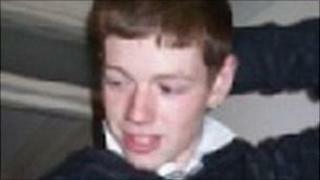 He told the court: "Nicholas Pearton was chased across a public park by a group of young but armed teenagers. He was unable to escape. "When he was caught he was stabbed and killed. "The origin of the fatal violence in the park that afternoon may have been an incident earlier in the day at a school." It was alleged that a 17-year-old stabbed the schoolboy - perhaps "the defendant who was able to reach Nicholas first" - but all six of the accused acted together, said Mr Brown. The jury watched CCTV images of Nicholas slumping in the doorway of the shop. His mother was nearby and had been told her son was "potentially in danger", Mr Brown said. "In those dreadful and deeply distressing moments she saw her son lying dead or dying. "His father too was soon on the scene, also very distressed." One of the defendants was then seen holding a knife "high above his head, as if bragging at what had just happened", he added. The trial continues on Friday, when the jury will visit the scene of the crime.